If there’s one thing I love more than the act of cooking itself, its a relaxed, therapeutic session of prepping great ingredients and seeing a large chopping board, choca-block full of lovelies in their full glory. I knocked together this Spanish classic for New Year’s Eve after discovering that the usually reliable La Figa (sister restaurant to Wapping’s infamous Il Bordello) which I had already booked in advance had turned to the dark side like every other restaurant that night, imposing a compulsory 70 quid a head NYE set menu. Grrrrowl and no thank you. Turns out the Lobster Aurora pasta I was so craving was **not** going to be on the menu anyway. But not all was lost for 2009. The jolly gentleman behind the Waitrose fish counter must have sensed my crest-fallen seafood craving and decided to mark down his Madagascan Prawns and Monkfish Fillets by 20% just as I walked by the aisle. What a champion. Anyhoo, do try this recipe out and don’t be put off by the rather long list of ingredients. Its actually pretty easy to cook and all you need is some good fish stock, fresh seafood and of course some quality saffron for a great paella. Heat a large frying pan over a high heat and fry the chorizo chunks in a few glugs of olive oil for 3-4 minutes, infusing the oil with the characteristic smoky paprika flavour. 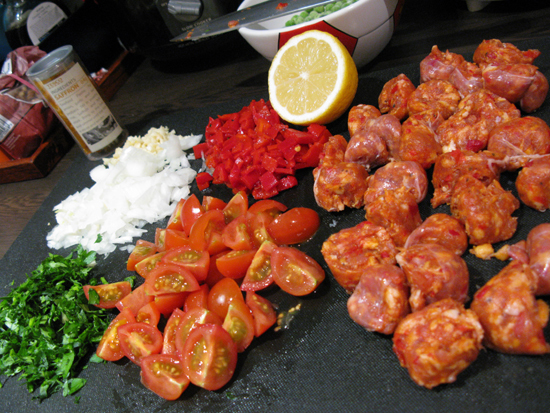 Once the Chorizo begins to colour, remove it from the pan and set aside. 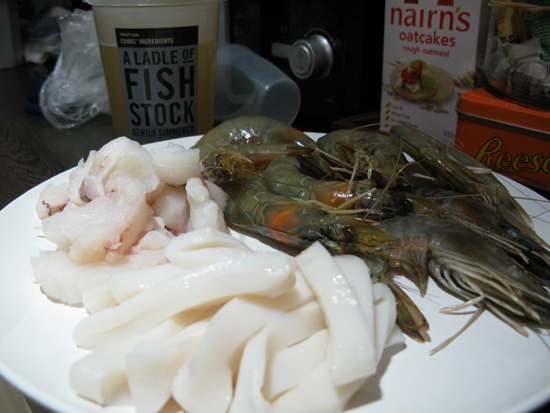 Turn the heat down to medium-high and fry the Prawns, Monkfish and Squid rings for 2 minutes each side. Remove the seafood just before its fully cooked with a slotted spoon and set aside. Now sauté the onion, dried chillies and chopped garlic in the chorizo-seafood-infused olive oil for a minute or 2, then toss in the Cherry tomatoes and Piquillo peppers for a further 2 minutes of cooking. Pour in the rice, paprika and cayenne pepper and stir well, letting the rice grains toast for a minute or so before deglazing the pan with the white wine. After the wine has reduced by half, add the chorizo back in with the pinch of saffron and top up with ¾ of the fish stock. Reduce the heat to simmer and throw in the peas. The great thing about Bomba rice is that you don’t really need to babysit it while it cooks on the open pan. Just make sure everything is spread out so it cooks evenly and add the remainder of the reserved fish stock with a gentle stir if the rice starts to get a bit dry. After 15-18 minutes, the rice should begin to soften. 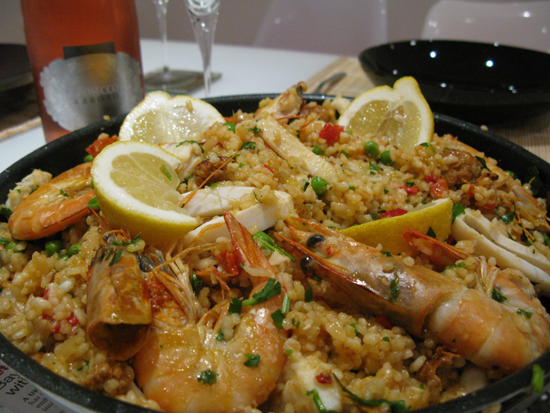 Scatter the seafood on top of the rice and finish cooking off the prawns, monkfish and squid for no more than 3 to 4 minutes. Season with salt and pepper and garnish with the parsley and large wedges of lemon. Now that’s what I’m calling a proper Feliz Ano Nuevo. This looks great – I like how you used shell on prawns. I hate how much harder it is to find those here! Suyin: its been ages! How are you? Have you finished at UCL at started F1 already? Yep, prawns are always a bit difficult to find unless you go to one of the larger supermarkets (and you often hv to pay thru your nose for them). Was taking a look at bread and butter! didn’t realise you wrote as well. Looks great. Will definitely be a regular and add to my blogroll. wow…. this looks great. you going to cook for us when u get back? Can do, though imagine its hard to find ingredients! I’m more up for being pampered when i get home though.